Place the tea bags, boiling water and sugar in a large heatproof bowl and stir to dissolve the sugar. Refrigerate for 30 minutes or until cooled. Remove and discard the tea bags. Place the cucumber and mint in a blender and blend until smooth. Strain through a fine sieve, discarding the solids. Add the cucumber juice and apple juice to the tea mixture and mix to combine. Pour into a 20cm x 30cm shallow metal tin and place in the freezer for 6 hours or overnight until frozen. Using a fork, rake the granita and return to the freezer until ready to serve. 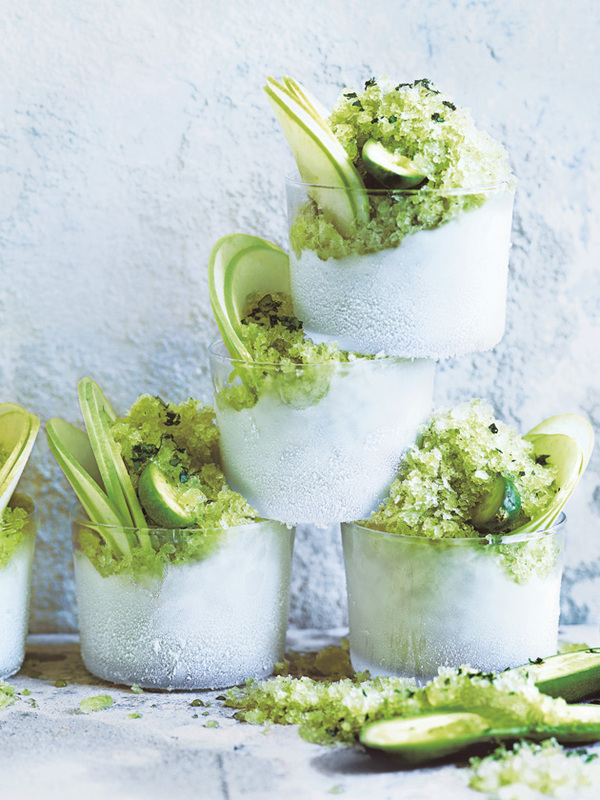 Divide the granita between glasses and top with the baby cucumber, apple and extra mint to serve. Serves 6–8.